1. Combine yogurt and sugar. 2. Stir soaked and softened gelatin sheets into the warmed Perfect Puree Raspberry. Blend until gelatin is dissolved. 3. Add yogurt mixture into raspberry mixture. 6. 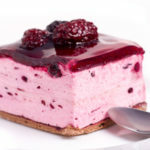 Place a thin layer of 8” round white sponge cake that has been lightly brushed with Framboise flavored simple syrup on the top of the mousse. If desired, add a baked short dough bottom brushed with raspberry jam under the sponge cake. Turn the cake out onto a cardboard or serving dish. Remove the plastic strip and the parchment from the top and spread with raspberry mirror glaze. Decorate with raspberries and mint. 2. Soak gelatin sheets in water until softened. 3. Stir the sheets with the water into the warmed Perfect Purée Raspberry Puree. Blend until gelatin is dissolved. 4. Glaze should be clear. 5. Smooth the glaze onto the cake quickly before it sets.